The armoire is gorgeous and I'm so envious of your beautiful home. What an awesome job you've done of it! !Feel free to come and revamp some of my furniture hehe! And your 'summer' banner is so sweet.. I'm 5 months preg and my craving has been summer in general but particularly STRAWBERRIES!! You've been teasing me a fair bit lately! It is stunning! You have such a stylish beautiful home I am envious and could only dream of such a place! I love it, it really looks amazing! THe quilt is perfect next to it. I've been coming here for about a week and I love your site, not exactly sure which link led me here but I'm happy to have found your site! 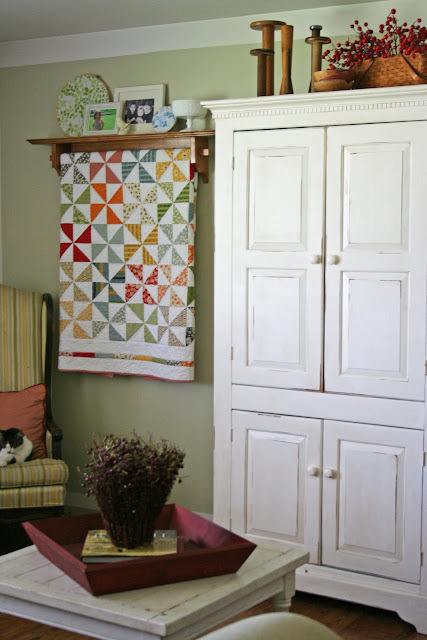 Love the armoir and the quilt too. I loved the aromoire in the before pic, but the creamy white looks fabulous against your quilt and the walls. The couches look great from here...but I know what you mean. I am wanting to slipcover my chairs to a cream color just to make things lightened up a bit more. Oh no, your wheels are turning to do another quilt to put in this room. I can't wait to see it. You inspired my with your pinwheel quilt that is in your bedroom and i am in the middle of cutting and piecing one togtether now. Thank you for sharing your wonderful home and your projects with all of us - I'm probably not the only one who feels a sense of satisfaction each time, as if I did the project myself. The world is a little brighter each day, because of you. I Love the top of the armoire too! Is your family still in the Army? My husband is thinking about enlisting, but I am scared to death about the lifestyle change that that would mean for us... just scared of the unknown really. I love that armoire! 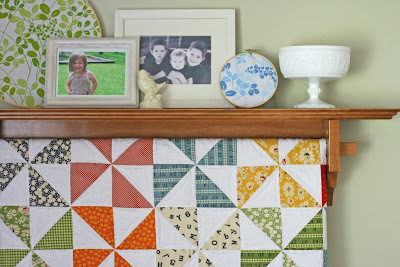 The white makes it look so fresh...and I love that pinwheel quilt next to it! oh gosh, that does look good. I have been procrastinating about doing the same with my little boy's dresser. Maybe when we move house I can finally say I'm ready to do it! I love the photo with the kitty on the chair in the corner. A perfect home picture! Very beachy looking with a country twist to the room... a happy place! Great job!! Good job, it all looks so nice. thanks for sharing - love it! See this is a perfect example of yesterday's post! White is so pretty and helps your walls stand out! Love it. 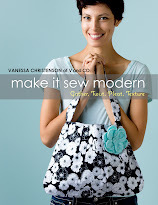 Absolutely gorgeous Vanessa! I LOVE it! Thanks for naming your colors. 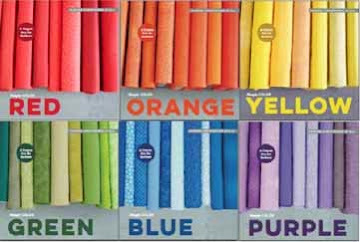 I have to repaint my little girls table and it may make my time in front of all those paint chips a bit easier! Nice job. It looks gorgeous now. It looks fabulous! I love white distressed furniture. I think it looks perfect! Love the quilt, too. I LOVE it, and your daughters quilt is PERFECT hanging next to it! I love everything!!! your home is so inviting and I love the white armoire - very fresh!!! it looks awesome miss v! i love your couches by the way...they look very cute just how they are. The armoire looks awesome. You did a great job. And that quilt is beautiful next to it. Great colors too. I love your green walls. Thanks for sharing. Have a great weekend. 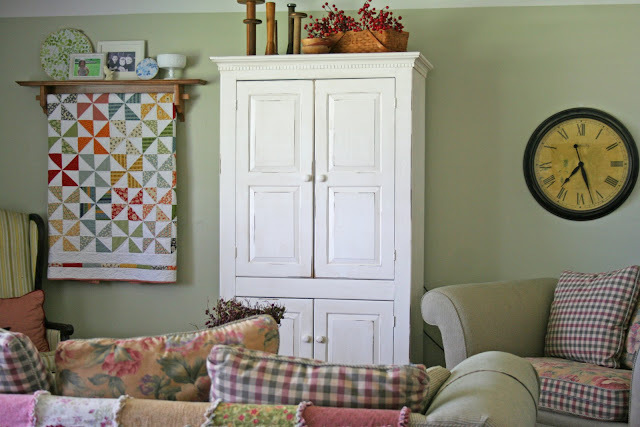 What a great piece of furniture and it looks so comfortable in your home with the quilt hanging next to it! I love the new color. I love that your armoire doesn't look freshly painted! Very nicely done :) And that quilt is just gorgeous. Awesome job! I've done the sanding edges trick, but never did the stain over the paint. Was it flat paint you used? How does the stain stick to the paint? sorry, kind of dumb questions. I love the way your project turned out, and your room looks so inviting and comfortable. 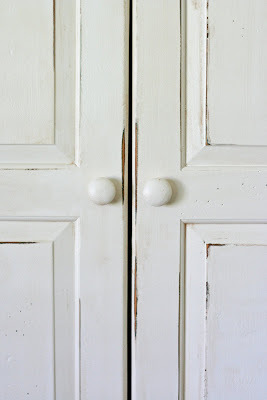 I love the way the armoire looks, do you use rub on stain over a flat paint? It looks like you didn't use too much so I was just wondering a bit about the details of your process. You have a lot of color in here but it all blends really well! I finished my version of your katie quilt today!!! thank you- thank you for the tutorial--- I made two for my daughter's two twin beds (she's 12) I love, love, love them!! Love IT! Can I copy? My armoire is so blah. Yours is beautiful. Thank you for sharing. Oh, I love it!! Great change!! Love the armoire! You did a fantastic job! The print that you love that's in the hoops - my mother has a set of sheets in that green print - must be from around the '70's? I've always loved those sheets - they're in excellent condition - I may have to "borrow" them! OK, is there anything you don't know how to do? It's amazing! I love the "NEW" armoire! You did a stupendous job on it! I have a beautiful Oak Armoire that I'm dying to strip and paint, but I paid so much for it (when "oak" was "IN") that I'm afraid to touch it!! I'm scared I'll ruin it!! I am looking for something new for our tv, or trying to convince DH to build one, since he has the skills! I am very tired of our huge, particle board entertainment center! Looks great!! Whenever I try to make something look shabby chic in a cool way, it looks just shabby in an old way. So I'm really impressed! it looks amazing white! nice job! but i can see why you put it off for awhile. that's not an easy job. esp. with kiddos around. LOVE IT!!!!! You did an awesome job with the antiquing! This looks amazing! Can you maybe give a little tutorial as to how to exactly do something like this? I'd LOVE to try, but I haven't a clue as wear to start! I know I am digging way back here, but I have a black bookcase and black armoire in my sewing room that desperately wants to be white! 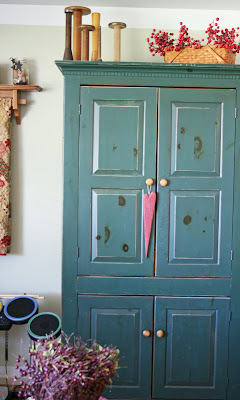 :o) I was curious if you did anything special to your armoire when painting it? I saw a liquid sander I am considering. I also know that kilz makes a new (new to me) product called clean start. You are suppose to be able to paint right over the surface.